Pics and Kicks: What's in YOUR Bag Ed Pingol? What's in YOUR Bag Ed Pingol? I am so excited to introduce you to my friend Ed Pingol. 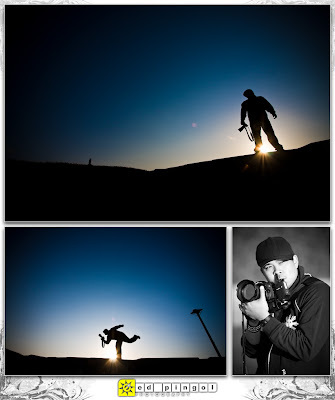 I met Ed at the Jonathan Canlas Workshop here in Hawaii in March, and I got to meet his sweet wife Monica (the other half of Ed Pingol Photography) at WPPI a couple of weeks later. They are a darling couple and a powerhouse of a photography team. Ed is known well throughout the industry for his mad ninja skills with the external flash. This guy knows his junk. Monica and Ed were just awarded 2nd place in Sacramento's best photographer of 2008 competition. Congratulations guys! I'm very happy for you. Me: So my darlings, what's in your bag? Start with camera body. canon 40d: the workhorse and back-up times four. . . we have four of these. Two a piece. And just a side note, you cannot not have back up gear. You're shooting a wedding that happens only once ("knock on wood!"). You have to have back up! Me: On to lenses, what lenses do you have? Me: Ok, well since you guys are "the stuff" as far as external flash is concerned, tell me about your flash system. canon 580ex speedlite, the work horse! Two of these guys. nikon SB-28 speedlight, cheap and awesome flash! We have 5 of these babies. 32 rayovac 15 minute AA batteries for flashes, remotes and well... that's it. AlienBee B800 Flash Unit, to increase ambient light in large halls. We have 2 of these. 5 Pocket Wizards to trigger anything i need to be triggered. Me: 5 Pocket Wizards huh. . . you could probably trigger a space station if you wanted to. . . you should try it sometime. Totally. So a lot of my readers have questions about gear, well more specifically about the cost of gear. They're wanting recommendations on good cheap gear. What would you tell them? Ed and Monica: Save your cash and buy right the first time. It'll hurt a bit but it really is the way to go. Remember, lenses are the eyes of your camera. Make sure your camera can see 20/20 especially if you're planning on shooting a wedding. Me: So how about the Canon vs Nikon battle to the death? What's your 2 cents on that? Me: What's in your computer room? I heard something on the wind recently that led me to believe you've gone back to PC. Is that true? Ed: I used to be a mac dude, but I'm one of those rare people that went back to PC's, it's true. Ed: It's cheaper and you can build a custom system for a fraction of the cost. dell xps 710 ferrari series tower with liquid cooled dual graphic cards with 2 digital output each. quad monitors. "argh argh argh!!!" (barked like Tim the Toolman Taylor). Me: How many weddings do you shoot per year? Ed and Monica: we have a cap of 35 weddings per year for 2008 and tentatively 30 for 2009+. Thank you for giving us the scoop. can't wait to see you again very soon! Don't miss previous issues of What's in Your Bag? If you have any follow up questions for Ed and Monica, please feel free to comment below and I'll be glad to compile them, get the responses and do a follow up post. Let's not inundate them with emails. They were ever so kind to take the time to dish in the first place! Also please comment below and let me know which photographers you'd like to hear from in a future issue of What's in YOUR bag? This is me signing off until Monday. I really liked this -- so informative and down to earth. Thank you! Gorgeous work! I decided that for now, I'm just going to feature my images that have an editing touch to them, and lightly explain how they are done. I'll also have some articles & useful information that have been passed on to me. Someday when I really get going on doing photography for others, I may feature that as well. I wanted to make sure it is OK that I included you in my sidebar under "Information & Inspiration for Photographers". I SO enjoy your blog, and what I've learned from you is simply insurmountable. I have a feeling that many others would benefit from your wonderful blog as well. Thank you SO much again, Natalie - You have no idea how much you've helped me and how much I appreciate you - you're so amazing! Much love and God Bless! You are so sweet! Congratulations on your exciting new path as an up and coming photographer! I wish you EVERY success. If you are really serious about moving in this direction you should really consider splurging on a workshop. The Jonathan Canlas workshop filmisnotdead.blogspot.com is fantastic! You should check out Michael and Anna Costa's forum, a photo for the people. They're pretty down to Earth and willing to help newbies along their way. I would check out nicolehill.blogspot.com. She is a photographer, and though she doesn't offer tips on her site, she is definitely a great photographer and can be an inspiration to you. She does offer classes. . . but they're in Utah! Ha ha. I'm hoping to eventually bring her here to Hawaii for a workshop. I'll let you know when/if that ever happens. THANK YOU for adding me to the sidebar! Thanks for sharing the Natalie Norton love! Well, if I HAD a bag, I'd be wishing for all those cool lenses. Thanks for EVERYTHING Natalie. You are amazing! ed and monica are UH-MAY-ZEENG!! thanks for another great article. i can't wait to read what's in your bag, natalie. tee hee! Very informative, as always. Thanks!